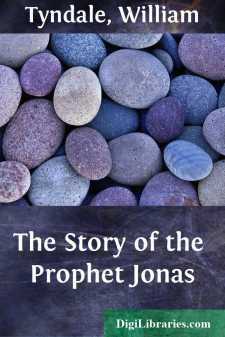 The word of the lord came unto the prophet Jonas the son of Amithai saying: rise and get thee to Nineve that great city and preach unto them, how that their wickedness is come up before me. And Jonas made him ready to flee to Tharsis from the presence of the lord, and gat him down to Joppe, and found there a ship ready to go to Tharsis, and paid his fare, and went aboard, to go with them to Tharsis from the presence of the lord. But the lord hurled a great wind in to the sea, so that there was a mighty tempest in the sea: insomuch that the ship was like to go in pieces. And the mariners were afraid and cried every man unto his god, and cast out the goods that were in the ship in to the sea, to lighten it of them. But Jonas gat him under the hatches and laid him down and slumbered. And the master of the ship came to him and said unto him, why slumberest thou? up! and call unto thy god, that God may think on us, that we perish not. And they said one to another, come and let us cast lots, to know for whose cause we are thus troubled. And they cast lots. And the lot fell upon Jonas. Then they said unto him, tell us for whose cause we are thus troubled: what is thine occupation, whence comest thou, how is thy country called, and of what nation art thou? And he answered them, I am an Hebrew: and the lord God of heaven which made both sea and dry land, I fear. Then were the men exceedingly afraid and said unto him, why didst thou so? For they knew that he was fled from the presence of the lord, because he had told them. Then they unto him, what shall we do unto thee, that the sea may cease from troubling us? For the sea wrought and was troublous. And he answered them, take me and cast me in to the sea, and so shall it let you be in rest: for I wot, it is for my sake, that this great tempest is come upon you. Nevertheless the men assayed with rowing to bring the ship to land: but it would not be, because the sea so wrought and was so troublous against them. Wherefore they cried unto the lord and said: O lord let us not perish for this mans death, neither lay innocent blood unto our charge: for thou lord even as thy pleasure was, so thou hast done. And then they took Jonas, and cast him into the sea, and the sea left raging. And the men feared the lord exceedingly: and sacrificed sacrifice unto the lord: and vowed vows. But the lord prepared a great fish, to swallow up Jonas. And so was Jonas in the bowels of the fish three days and three nights. And Jonas prayed unto the lord his god out of the bowels of the fish.